Discussion in 'Civ4 - Stories & Tales' started by Lone Wolf, Jul 21, 2012. Another RFC AAR, with another country which has the city on Bosphorus as its capital. RFC Epic with some leaders from DoC added, Emperor, going for the UHV for an easy game. 3000 BC start. In early 1280'ies a Turkish warlord named Osman had declared his independence both from the Greeks and the Arabs, founding a small beylik in Asia Minor. He had dreams of expanding his small holding, leading it to greatness. After consolidating his small realm, he sent his Ghazi army against the Greek city of Byzantion. Some leaders of Europe, that saw the Greek demise as conductive to their own interests, formed a partnership with Turkey. But when it was transferred, his troops conquered it anyway. The Dutch were regarded by Europe as a very cynical and mercantile people because they had no problems trading with the Turks. The Russians, on the other hand, were much more anti-Turkish. Looks good! Will be watching. Osman died in 1341. He was succeeded by Orhan, his son. The Greek state, after the determined Turkish assault, had collapsed into squabbling principalities. Skilled Turkish Janissaries easily dealt with the Epirote armies, even with the Despot of Epirus buying expensive War Elephants from Africa. The Russians, skilled in Steppe tactics, were more dangerous to the Turkish state. But skilled Ottoman Sipahi cavalry managed to save Olbia from the Russian troops. After a skilled maneuver by the well-equipped Turkish army destroyed the Russian troops, the Tsar signed peace with Orhan. Orhan was also known as a patron of Syrian stained glass industry. He continued to conquer the Greek principalities. Athens, the capital of Attica, "the Jewel of the Mediterranean", was a thriving city. Osman died, knowing that his efforts strengthened the State and the religion of Islam. His son Murad was a peaceful, philosophically minded man that dedicated his time to reforming the administration, sponsoring the building of mosques, and writing poetry. He died in 1420. Murad's son Bayezid, was known as a more warlike personality. As if to test him, the Holy Roman Emperor declared war. The German Emperor enlisted the help of the inhabitants of Venetia and Dalmatia to attempt a victory over the Ottomans at the sea. But due to the skilled Turkish admirals (some of whom were Greeks who converted to Islam) the naval treat from Germany was defeated. But the Sultan Bayazid proved his military prowess by organizing an assault on the Germans. The Sultan delivered gifts and advisers to the faraway court in Mongolia. Despite Bayazid's warlike character, his reign saw the Ottoman poets adopt many Arabic and Persian cultural influences. In an attempt to relieve Christendom's pressure on the Caliphate, the Porte agreed to share some Turkish military secrets with France. After the Sultan's death, he was succeeded by his son Mehmed. Mehmed had the reputation as a very cultured, but a very ruthless man. Rumours were that he organized the poisoning of his four brothers to inherit the throne. Spain decided to test the new Sultan by declaring war on the Turks. Most of your game pics arent working. Really? They work for me fine. Oh, and great chapter! The arrogant, crusading Spanish Queen had assembled a large army in Wien. A Great Artist from Athens arrived in Istanbul. His military poems increased the troops' moeale. The Spanish advance their troops. However, it seems that the German Emperor didn't feel at ease with the intolerant crusading spirit of the Spanish Queen, and signed peace with the Turks. The Grand Vizier who arranged the peace was honored, but a month later he was delegated to a faraway province in Anatolia, and then killed there. The Sultan didn't want any popular people competing with him. But his army was massacred by the Janissaries with Cannon support. Sultan Mehmed fell ill and died soon after the victory at Wien. A legend says that he was poisoned by one of his concubines, who was of Spanish descent. Before his death, he ordered the killing of all his sons except one, Murad. Love how you didn't even touch the Aztec being destroyed or the incans becoming a vassal state. The new Sultan kept the Ottoman policy of co-operating with France. Major celebrations were arranged across the Caliphate when Ukraine was taken from the crusading infidels. Meanwhile, the Sultan began the policy of trade with other Asian nations. Some Turks were not happy with sharing the discoveries with the idol-worshipping infidels, but Murad was popular enough after his successful war with Spain. The English were no fans of Spain and agreed to pay a decent price for Turkish Wine. As Murad II died, he heard the news that the Spanish were so humiliated, they agreed to sign a vassalage compact with France. Since the French were well-disposed to the Ottomans, it was good for the Caliphate. 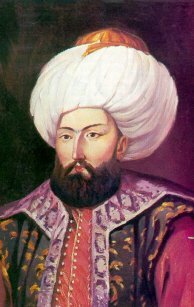 Murad's son, Mehmed II, attempted to cooperate with the Buddhist Persians. But the mullas and the ulama considered such actions of the new Sultan - cooperating with idolators - to be heretical. They organized the overthrowal and murder of the Sultan and placed his more fanatical brother, Bayazid II, on the throne. Despite his fanaticism, Bayazid was a patron of learning. During his reign, first Ottoman-produced map of the world was drawn. The Muslims of Sicily revolted against their overlords, agreeing to join the Caliphate. But the Persians, upset at the Ottomans for the killing of Mehmed II, declared war. Islamic Crusades. I demand them. On a side note, here's a screenshot of my Time Victory in DoC 1.9. The power in Eastern Canada is Thailand. Also note Mughal Scandinavia. I wanted to achieve a UHV, but the English resisted for too long. Then I went for Spaceship, but teching was slow and I didn't have the time. So I settled for time. Turkish armies had pushed back the Iranian raiding parties. And the Sublime Porte didn't forget to trade with friendly Europeans as well. Finally, the Shah had advanced his own army in Mesopotamia. That Persian army was holed up in Baghdad for so long because of the bug in original RFC, which restricts the movement of large AI stacks. The Indians were willing to cooperate with the Ottoman Sultan, since they were afraid of the Iranian threat. The battles in Iraq were huge and bloody. A poet exclaimed about them that both Tigris and Euphrates had their water turn red from blood in these days. The Sultan could notice with satisfaction that most of that blood was shed by Iranians. When Turkish Sipahi started to raid the city of Babirush itself, they were resisted only by the weak local militias. The Ottomans easily captured the city. But the Sultan was also a patron of learning. The wisdom of Al-Razi was famous through the entire realm. On his deathbed, the Sultan received worrying news of developments in India. Apparently, the English, using discord among local rulers, were making themselves masters of Indostan. The Indians were willing to cooperate with the Ottoman Sultan, since they were afraid of the Iranian treat. On his deathbed, the Sultan received worrying news of worrying developments in India. Apparently, the English, using discord among local rulers, were making themselves masters of Indostan. Very, very worrying. Just doesn't sound right using worrying twice there. Other than that, though, great! During the reign of Bayazid's sons, Suleiman and Selim, the long war with Iran continued. Susa, the venerable and ancient Persian city, was easily taken by the mobile Sipahi, recruited from Anatolian regions. Sirajis was taken and retaken multiple times. In the end, it remained Persian, but the Shah was forced to acknowledge all other Turkish conquests as legitimate. After the end of the Persian war, Sultan Selim celebrated a magnificent triumph in Istanbul. O Suleiman a true Moslem regards this solemn behest. Shelter the good, and be severe to wrongdoers. Is as good as taking part. Our strong hands hold the fate of the World. The regard and affection of men.